Summer shift dresses...a Mama's best friend. And this little ditty from J.Crew has quickly become a favorite. The shape including the pockets, subtle arrow pattern, bright color, and neck and sleeve detail are all perfect. The dress is still available and deeply discounted and I also love this chambray version. And how great is this monogrammed bag? It really is the perfect size and the crossbody strap is super helpful for this busy Mama. 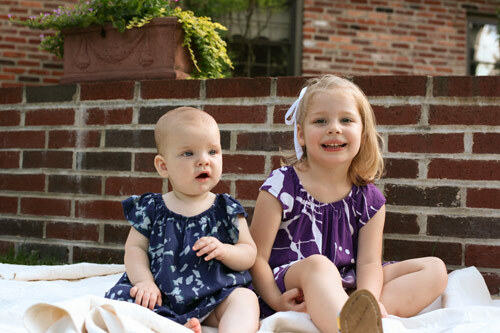 Speaking of adorable dresses, I love my two little ones in their Loola dresses. Currently the dresses aren't available, but check out this little striped number. And this is the best photo I could get of the three of us. This is real life...with toddlers and babies.